Through seven seasons, the Pittsburgh Penguins Foundation’s Gameday Auction has raised over $1.1 million with over $135,000 raised during the 2017.18 season alone! 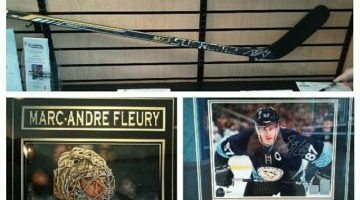 During each game, our auction display is located outside of the Key Bank Club near Section 104. 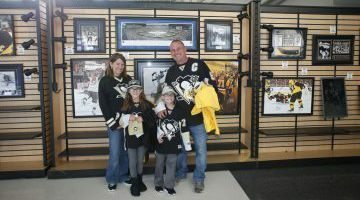 Through a mobile platform, fans are given the opportunity to "bid to win" on fantastic team items from the past and present to support a variety of Penguins Foundation programs. The ease of bidding and winning this season is thanks to our new friends at Givesmart! 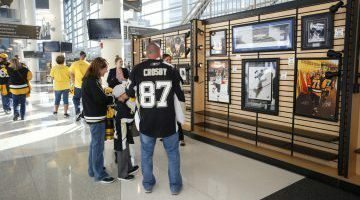 By texting PENS to 52182 or visiting pens.givesmart.com, fans both at the arena and at home can check out the latest memorabilia pieces, view a clear image of each piece, sort by items without bids, AND bid to win! 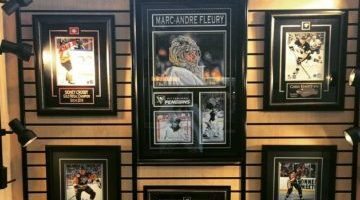 From man caves to offices to your Pittsburgh Penguins dedication wall, exclusive signed Penguins memorabilia has a place anywhere. 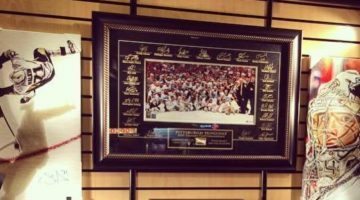 From autographed photos or game used equipment to one-of-a-kind unique pieces of Penguins art, every home game the Penguins Foundation hosts a silent auction behind Section 104 where fans can bid to win their very own piece of Penguins history. Guests can peruse our shelves lined with moments of victory and easily bid on these items using their smartphones while at their seats without missing a second of the excitement of the game. Our fans at home are not excluded from the fun, for they too can virtually view our items and bid from the comfort of their couch. Follow us on social media for upcoming special events at the Gameday Auction! Game used pieces and buy now items are not all the auction will offer this season. The Penguins Foundation is teaming up with popular local artist Cody Sabol, known for his speedy and hyper realistic art, to do live paintings at games throughout the season. The Penguins Foundation will also be featuring special signed pieces by additional local talent so be sure to visit the Gameday Auction during every Penguins home game! Follow the Penguins Foundation on social media for a behind-the-scenes look at the Gameday Auction. And, keep an eye on Twitter to keep updated on when the Gameday Auction goes live and when it will close. Want more control over your auction shipments? Done. Visit fedex.com/delivery to register for FedEx Delivery Manager. FedEx Delivery Manager allows for you to receive shipment alerts, provide delivery instructions, request a hold for pick-up and more!